Are you a total art buff? Do you live to be near the water? Can supporting a small business put a bigger smile on your face than a Target run? These three communities within D.C.’s historic neighborhoods may be just the place for you to put down roots and become a regular. Monroe St. Market consists of three apartment buildings located in Brookland in northeast D.C. This tiny block within the greater Brookland area has its own unique vibe, thanks to the 27 art studios that exist there. From dance to sculpture to pottery, the Arts Walk is its own little community of creators. The Arts Walk isn’t short on good eats, either. You can discover a new favorite beer at Brookland Pint, which serves up an extensive menu of local craft beers. If you need a midday pick-me-up, you can enjoy the interesting pairing of tacos and coffee at Fox Loves Taco, the sister restaurant to Chevy Chase’s Little Red Fox. Their swoon-worthy Instagram is sure to inspire the creative side of anyone who swings in for a cup of joe. This mini-community is an artist’s safe haven, and will quickly feel like home for any creative. 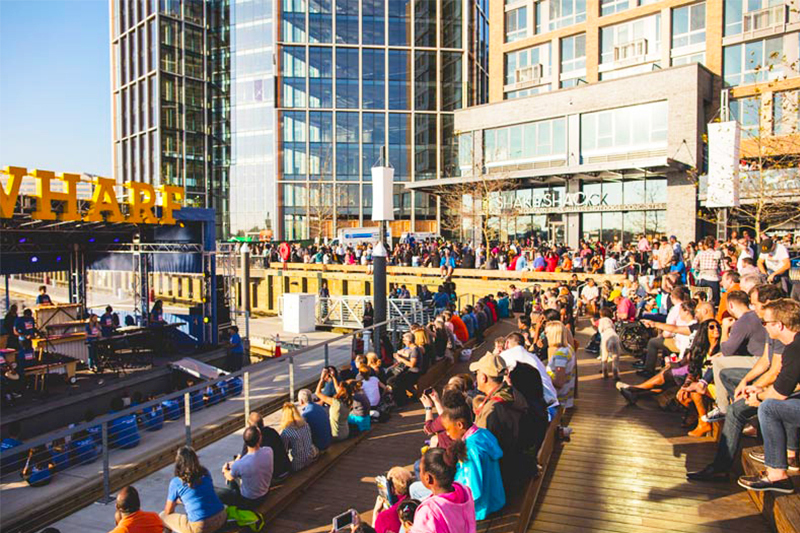 The Wharf has been the talk of the town since it opened late last year. Located in the Waterfront neighborhood, the Wharf is around three blocks long and filled to the brim with dining, shopping, and event space — this small stretch seems like it could be a neighborhood all its own. It’s somehow managed to become an area for people of all ages and with all interests. Dining includes British pub food and drinks at The Brighton, and Caribbean fare at Kith and Kin, among so many others. 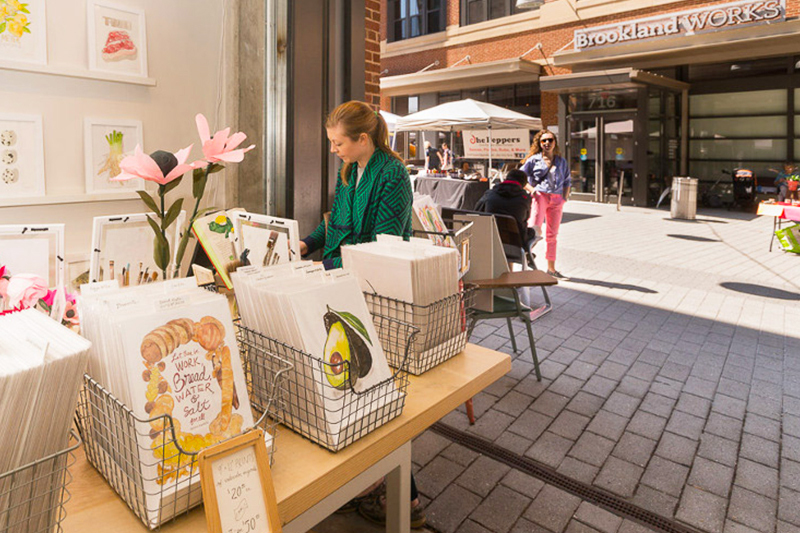 Retail includes new shops like A Beautiful Closet Boutique, and District classics like the well-known Politics and Prose Bookstore. You can truly get lost wandering up and down side streets and docks with a cup of coffee in hand. The Anthem’s stage has already hosted a lineup of powerhouse performers such as the Foo Fighters and will welcome the likes of Lorde, Tyler the Creator, and even Joe Biden in the first half of the year alone. Eastern Market has been a Capitol Hill staple for over 100 years, so it’s no wonder so many people define the surrounding area by it. While it’s not a stand-alone neighborhood, you’ll constantly hear people expressing a desire to live near the market specifically — not just in Capitol Hill. 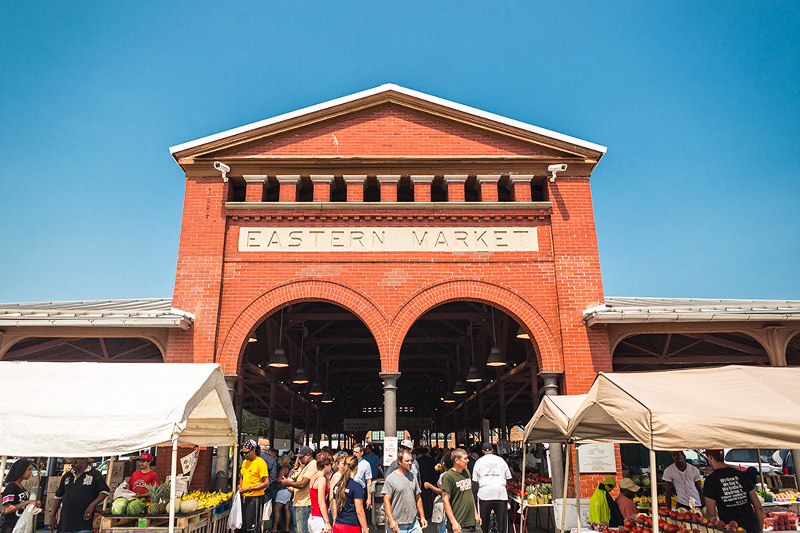 That’s because Eastern Market is the home of some of D.C.’s most talented artisans. The market is open every day but Monday and some holidays. While there, you can find some amazing eats (like the chocolate filled churros from Alexa’s that I dream about at least once a week) that showcase D.C.’s diverse communities. If you don’t feel like sitting down at one of D.C.’s international restaurants, just take a stroll through Eastern Market. You’ll also find unique goods. Vendors offer furniture, clothing, beauty supplies, and art. This is the area you want to be in if you don’t want the same Ikea Lack coffee table everyone else has, or you’re looking for a gift you know your mother won’t want to return. You’ll find talented photographers who capture D.C.’s neighborhoods, or intriguing sculptures from artisans like Shumba Masani who build animals out of cans, dubbed Canimals.